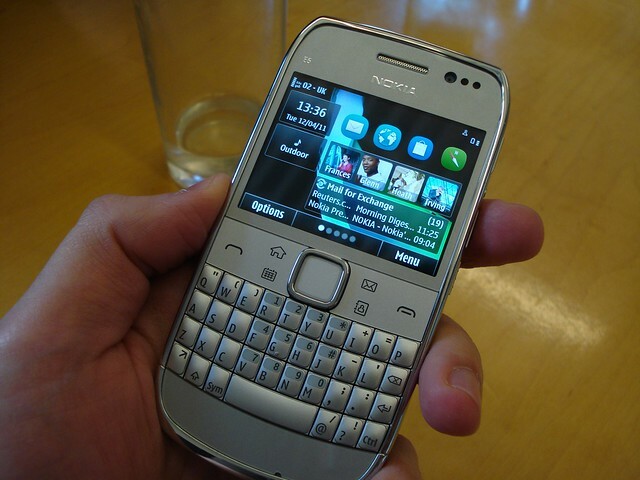 Nokia E6 and Nokia X7 info-explosion: gallery, video walkthrough and hands-on impressions! As Jay already hinted out, there was a lunch/meeting yesterday at WOMWorld/Nokia HQ in London , where bloggers could familiarize themselves with the freshly announced Nokia X7 and E6 smartphones, and even more – ask questions to the respective product managers of these devices. I was extremely happy to be there as well, as seeing the devices in question so close up and personal has proven to make a noticeable difference in the perception. I even shot a couple of walk-through videos for you to enjoy, so let’s get right to it! I’ll start first with the newcomer in Finnish company’s business range of smartphones, the E6. I think virtually everyone at the meetup was very pleased with the E6, especially the previous owners of Nokia E71 and E72. While this is not the case with me (I’m more of a N900, E7 kind of user), I could most certainly see where the excitement is coming from. The E6 has a compact design that comes with a comfortable and thought-out qwerty keyboard that is perfect for single-hand usage. My only gripes with the control elements of the device are related to the so called one-touch keys for accessing calendar, messaging and contacts. Unfortunately, these keys are located under a single piece of plastic so there’s a risk of accidental miss-presses. I’d definitely prefer them raised separately as in the case of the E71. 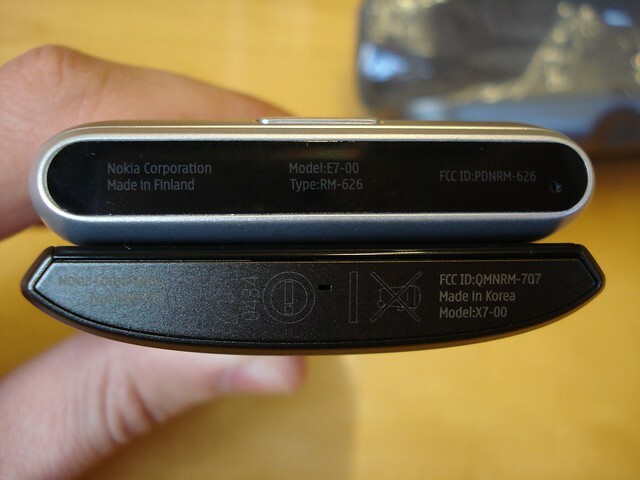 Following user complaints, Nokia has removed the optical navi key function from the d-pad, but I also think there’s simply no sense in having it along with the touchscreen. The biggest step forward is, of course, the high resolution, touch-sensitive TFT LCD screen. Packed into just 2.46 inch area, the VGA (640 x 480 pixels) resolution makes the screen look impressively sharp and clean, and that should definitely help improve the web browsing and document viewing experience. There has been a few interesting changes in the OS to keep the Symbian^3 user experience enjoyable even on such a small touchscreen. For example, the homescreen now incorporates altogether 5 different screens, and each can be populated with up to 3 widgets similar to the ones we have on other Symbian touch devices. This, however, means a lot of scrolling work for the user. Having a preview pane or even keyboard shorcuts to immediately jump to the necessary screen would be a very useful feature I’d like to see introduced before the device ships in Q2 this year. All in all, I had no difficulties navigating between the menus either using the touchscreen, or via the physical controls. 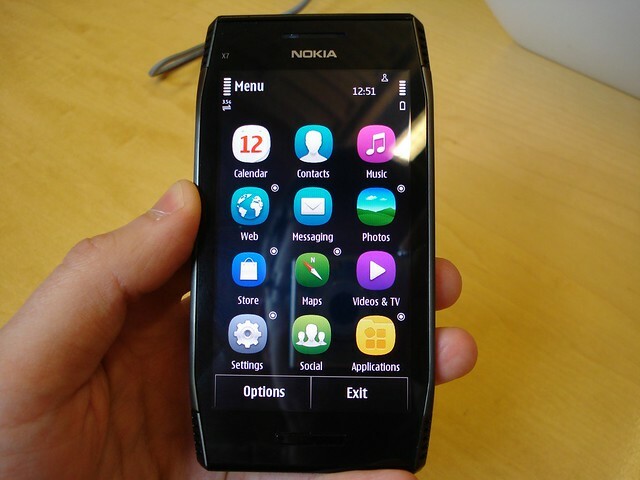 Also running the Symbian^3 ‘Anna’ update was the new Nokia X7. I actually enjoyed the distinctive, semi-futuristic look of the X7. 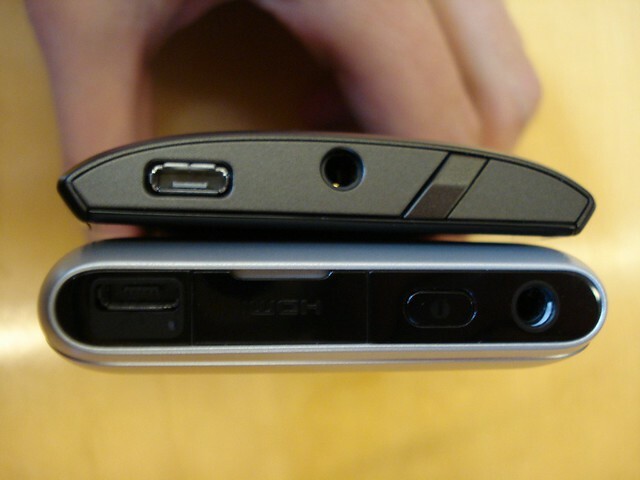 It’s unibody design means the stainless steel battery cover flows together very naturally with the front of the phone. The 4 speaker grills at each corner of the device is part of the appeal, but sadly the second pair of speakers around the earpiece are purely cosmetic. Traditionally, the Nokia X series included multi-media focused devices, and I’m sure gaming is another major aspect of the entertainment on the go. Now coming from this, things are a little less clear with the X7. 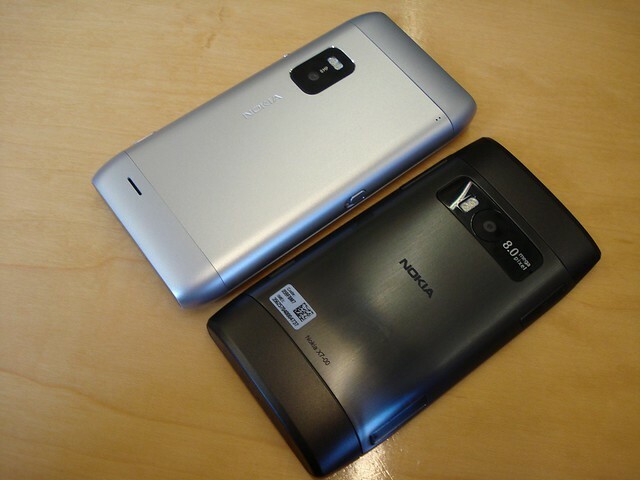 The hardware platform, like the CPU and GPU, is identical to the rest of Symbian^3 phones. Aside from the size of the screen, there’s nothing else that helps X7 truly stand out from the rest of his Symbian^3 brethren. For instance, the Nokia N8 offers superior 12 Mpix auto-focus camera (against the full-focus aka EDoF 8 Mpix camera), unique and eye catching aluminium construction, 16 Gb of built-in memory (against a pre-installed, 8GB MicroSD card) and a mini HDMI port. So ultimately I think a crucial role in the success of the X7 will be the price. Given that the Nokia N8 will most likely see further price drops in the coming months, X7 competing with company’s own multi-media powerhouse is just not a viable strategy in my view. 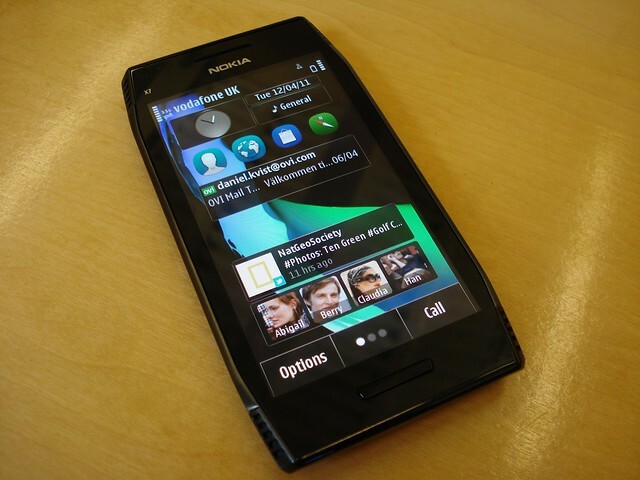 As with the Nokia E6, the Nokia X7 is said to come out in Q2 later this year.